Each player holds the same 13 action cards. In each round, two cards are laid out face-up in front of each player with which he carries out two actions. He can take pesos or building materials (brick = red, sandstone = yellow, glass = blue, loam = brown, debris = gray), hire workers, bring his master builder into play, collect taxes, send out thieves, tear down buildings, and more. The hoarded resources are used to construct buildings and, thus, gain victory points. The player who first reaches a certain number of victory points wins. Two players play to 25 victory points, three players to 20 victory points, and four players to 15 victory points. Each player get 2 different player aids cards and put them in front of himself. Each player receives an identical set of 13 action cards and takes them in his hand. Attention: please read the text of the cards carefully and the explanation how to use them. 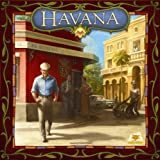 Place the Pesos, workers, and the bag (containing all 80 building material cubes) as a stock at the table edge. Shuffle the 36 buildings. Reveal 12 building cards and place them face-up in two rows of 6 cards each in the center of the table. Note: there should be at least one building with a value of 1, 2, or 3 on either end of at least one of the rows. Place the remaining building cards as a face-down draw pile at the table edge. Each player draws one building material cube from the bag and places it in front of himself. Additionally, each player receives 1 Peso, which he also places in front of himself. Without looking, draw three cubes from the bag and place them below the two rows of face-up building cards in the center of the table. Also place four Pesos in the center of the table. Each player chooses any two of his 13 action cards and places them face-down for the time being in front of himself. Once all players have done that, the two actions cards are revealed and arranged with the lower numbered card on the left. Each round consists of the following three consecutive phases: First, all players, separately and in turn, carry out phase 1 ("carry out two actions and purchase buildings"). In phase 2 ("supplies"), three new Pesos and three new building materials are placed from the stock in the center of the table. In the concluding phase 3 ("new action card"), all players place exactly one new action card in front of themselves. The player whose laid-out cards show the lowest number begins and carries out the actions of his two cards, in any order. The player with the second lowest number takes his turn and carries out his two actions in any order. Now, the player with the third lowest two-digit number goes, and so on, until each player has taken their turn and carried out his two actions. Example: Vanessa begins, since her 07 is the lowest number. 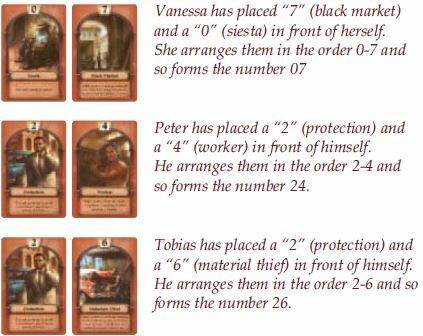 Then it's Peter's turn, because of his 24, and then Tobias' with his 26. The actions are explained in detail on the cards (and also in the annex to these rules)! The two action cards remain lying face-up. Note: An action cannot be skipped - unless the respective card expressly allows it. In case several players show the same number, the player among them owning the fewest victory points begins. If their number of victory points is also the same, the player owning the fewest colored building materials in total begins. If there still is a tie, the one owning the fewest Pesos begins. Then the fewest workers. Then the least gray building materials (debris). If they tie in all respects, the younger player begins. On a player's turn, after he has carried out both of his actions, he can buy any number of the face-up building cards. In order to do so, he must fulfill/hand over what is shown on that particular building card. Building materials and gray debris must be handed over and returned to the box (removed from the game). Pesos and workers are returned to the table edge. If the building master is required, the player must have him laid-out in front of himself now, i.e. as one of his currently laid-out action cards. The building master is not handed over after the purchase of a building - he remains where he is! Very important: In principle, buildings can only be purchased if they sit on the far left or the far right of the two rows of cards - this makes exactly 4 available cards at all times. During the course of the game, the cards are essentially purchased "from the outside to the inside". A player may choose in which order he purchases which card(s) in which row. For example, provided he has sufficient resources, he can first buy the upper left building card, then the lower right one and immediately another lower right one. Note: Only the current player in phase 1 may purchase buildings - no one else. In phases 2 and 3 no buildings at all can be purchased. 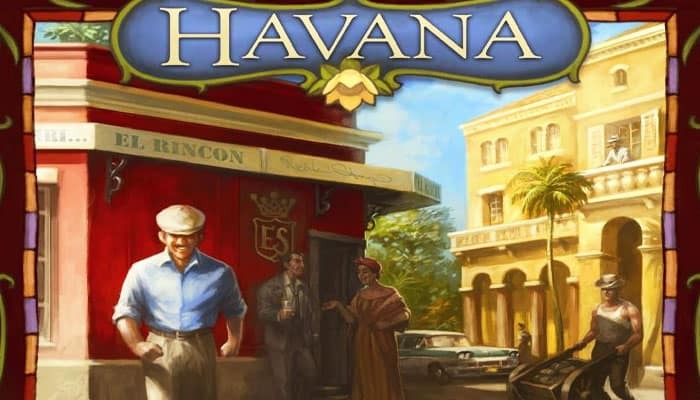 If a player purchases a building, he may choose to pay 5 Pesos instead of a worker (back to the stock). Also, 5 gray building material cubes (debris) can be paid instead of any one colored cube of building material (removed from the game to the box). Note: It is not possible to swap workers for Pesos or colored building materials for gray building materials! If in the course of the game only two cards remain in a row, immediately draw 4 new buildings from the face-down draw pile at the table edge and place them face-up between the two old cards. Draw 3 cubes from the bag and place them in the center of the table. Additionally, place 3 Pesos from the stock in the center of the table. If there are still Pesos and/or building materials left from phase 1 (and/or earlier turns) in the center of the table, they remain where they are. 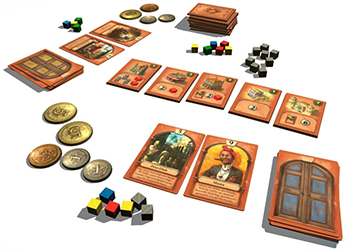 Pesos and building materials may accumulate in the center of the table over the course of several rounds. Separately and in turn, each player takes exactly oneof the cards from his hand and places it facedown on top of any of the two action cards laid-out in front of him. Note: This happens in exactly the same order as the actions were carried out in phase 1 (according to the numbers formed)! Once every player has laid down one of his cards, they are revealed. The old card underneath is placed face-down next to each player (on his own discard pile). Now, each player again arranges his two faceup cards by the shown numbers in rising order from left to right, in order to form the smallest possible number. For example, a 2 and an 8 must always be arranged as 28 - never as 82! A 6 and a 0 always become 06, never 60! Vanessa reveals her face-down action card and an "8" appears. She places the old action card, i.e. the "0", face down next to herself on her own discard pile. Then she arranges her two current action cards as 78. Very important: If a player now, i.e. after revealing the face-down action card, holds no more than two action cards in his hand, he may now take all of his discarded action cards back to his hand - he once again has 11 hand cards at his disposal. All of the following rounds are played just as described. If, in a two-player game, one player has 25 victory points or more lying in front of him after phase 1, the game ends immediately with him the winner - the round will not be finished! In a three-player game, 20 victory points must be gained like this, and 15 victory points in a four-player game.